Aval Vikatan is one of the famous tamil magazines from Vikatan publications. 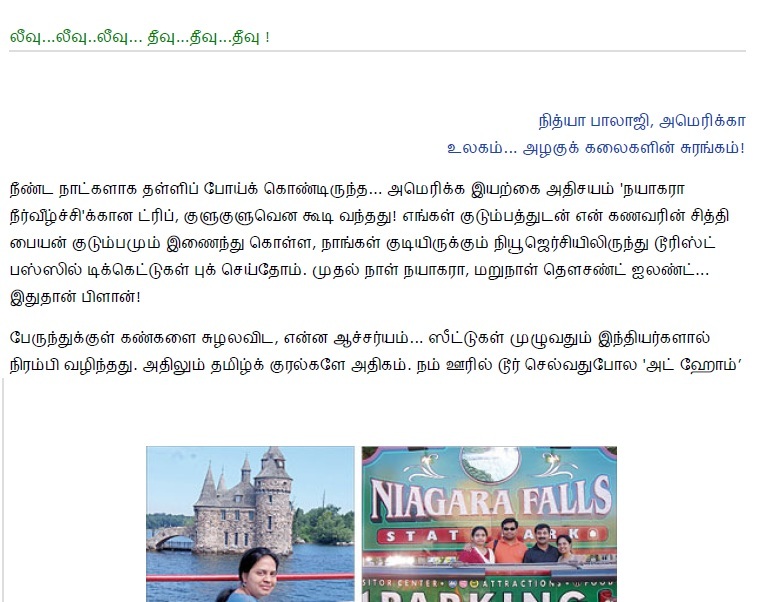 They have featured my article about Niagara in the issue dated 24-5-11. Thanks to Aval Vikatan and my friends who wished me through mails and phone. Hey, congrats Nithu, good job. If possible, do post a clipping picture. ITS NICE IF WE COULD READ IT. NOT HEARD FROM YOU ITS LONG TIME :-) HOW ARE YOU? Congrats Nithu! hope everything is ok with you as you have been MIA! Congrats Nithu.Hope all is well at your end. Congrats Nithu and keep rocking dear!!! Congrats Nithu. Collect ur award from my blog dear! Going thro' ur other posts..
congrats Nithu..have read the post only recently in Aval Viketan..
you have done a great job..well presented..